It really feels like spring here in Osaka—finally! Flowers starting to bud, bees buzzing, and birds chirping. But that also means, no more winter food. Many dishes in Japan are seasonal. I grew up in Texas, and yes, we ate seasonal food (I think). Japanese food is even more seasonal than what I had as a kid. For example, you can't get certain things at the supermarket throughout the year—such as ikanago (I love ikanago!). Well, at least where I live. From what I remember in Texas, you could get whatever you wanted...whenever! Above, you can see chopped vegetables, which, of course, are available year round. 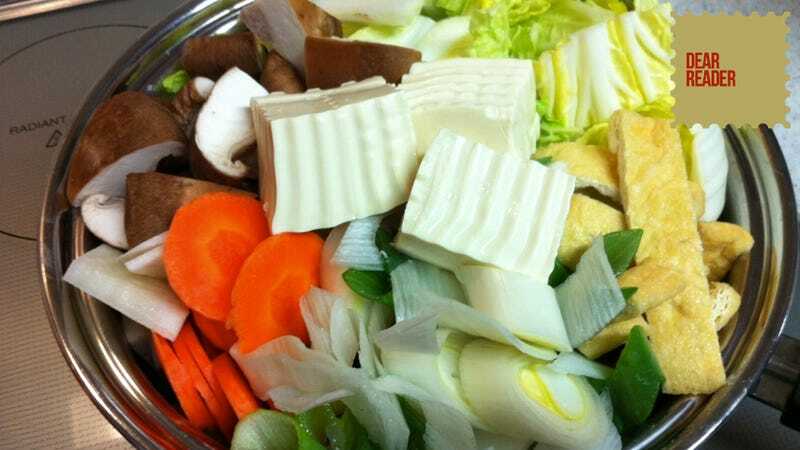 However, they were about to be cooked in a hotpot called "nabe". This particular nabe was miso nabe. It was delicious! And since it's a hotpot, people usually eat it in winter. So we made nabe at home this week one last time before spring officially starts. Trying to think of some seasonal dishes I ate in the States that weren't connected to holidays. If you know any, hit up the comments.